Mill Section | Fin-pass Mill | NAKATA MFG. CO., LTD. The mill is systematically designed by FEM analysis from breakdown to fin-pass and sizing. The mill section is equipped with our proprietary technologies to produce the best tube/pipe quality. The fin-pass mill is a very important mill followed by FFX forming mill to create suitable welding conditions. NAKATA's system provides the best roll shapes and positions supported by FEM analysis. In addition, our proprietary roll change design, ""Quick Change System,"" dramatically reduces workers' workload and contributes for improved productivity. Weld Bench is the most important equipment that determines the final product quality. It comprises of SQ stand, welder and bead scarfer. NAKATA selects the best equipment for the characteristics of pipes customer has in mind. We use induction type and contact type for high frequency welding. 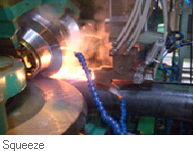 NAKATA's proprietary know-hows reduce spark and wear, which enable stable operation. Recent years, laser welding is attracting interests as a welding method that has the least heat affected zone. Challenge was controlling the edges at high precision. NAKATA's outstanding forming system made it possible to squeeze edges in ideal shape, and we are working for further development. The bead scarfer incorporates our proprietary design and we receive high satisfaction from our customers." De-twist Stand is an equipment that controls the position of weld seam by twisting formed pipe. Our caliber design allows common-use rolls within a certain design range. It is usually installed before seam heat treatment or sizing equipment. We can prepare automatic adjustment system equipped with seam tracking. Sizing Mill has optimized and balanced rigidity for adjusting dimensions and shapes of the final product. 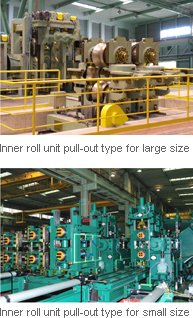 In most cases, the structure is the same as FP mill and equipped with Quick Change System. The Turks-head (TH) stand ensures pipe straightness by working together with the sizing mill. For machine specifications, please let us know the customer standard as the number of stands changes depending on the pipe standards.